The commission staff report points out, as we do in our Coastal Commission brief, that removal of the fire pits would violate the Coastal Act 30213. The Coastal Commission will vote on this matter at their March 6 meeting in San Diego. Corona Del Mar Today has details on this. San Diego has announced that it will fund the fire pits in the next city budget. We are good for 2012-2013! Big thanks to all of the supporters of this San Diego tradition! As of early 2013, the San Diego Fire Pits are safe. (Updated May 12, 2011, 11 PM) A coalition of non-profits including the San Diego Foundation, the Convention & Visitors Bureau, the Hotel Motel Association and several other organizations have committed to funding fire pit maintenance for the 2011-2012 fiscal year. The organizations have raised about half of the $120,000 needed to fund the fire pits for the full year. Donations are being accepted through the San Diego Foundation Save our Fire Pits fund. The San Diego Foundation is working to create an endowment to save the fire pits for years to come. Why should we save the fire pits? Simple outdoor pleasures make San Diego great. 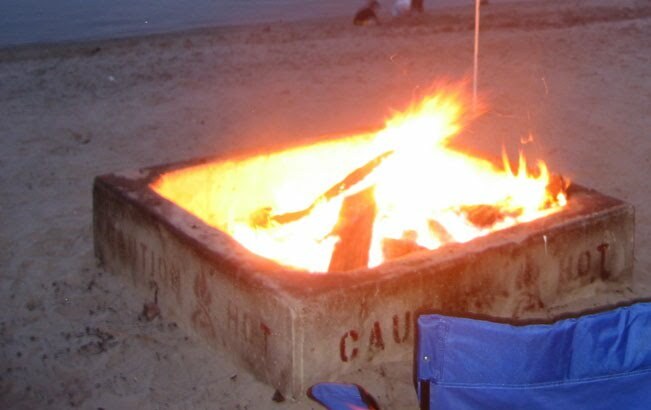 Fire Pits on the beaches have survived for decades, through prosperous and lean times. Let's not let the city use these tight times as the excuse to eliminate them forever. This is an opportunity to reduce the costs, but not destroy a San Diego tradition. Costs could certainly be cut by reducing off-season maintenance, switching to seasonal staff, or changing the methods used to clean the pits. It seems that costs have already been reduced from $173,000 to $120,000 per year since the 2008 proposal. The California Coastal Commission has now told the city of San Diego that they need to get Coastal Commission approval to remove the fire pits. Other offices of the Coastal Commission have recently told the same thing to Newport Beach and Huntington Beach. It is important for you to let the city know, now, by phone or email, that you officially object to the removal of the fire rings. Learn more about the fire rings and the coastal commission. The fire rings are a valuable public amenity that provide safe family enjoyment on the beach. What can you do? Contact the Mayor and the City Council today! Really, their staff will politely answer the phone and take your comment. Follow the link to City Hall Contacts. If you live in the city, it's best to call your council member on the phone. Otherwise, you can phone the Mayor's office (619-236-6630). For the 2010-2011 fiscal year, the City of San Diego had a donation page where you could contribute to save the fire pits. You can see a list of donors at the page. To contribute to save the fire pits in 2011 and beyond, please visit the San Diego Foundation. *Note, savethefirepits.com is not collecting any donations. Please contact the San Diego Foundation at the link above to make donations. The San Diego Foundation may be able to facilitate significant donations. For additional coverage and the "Adopt-a-fire-pit" campaign in Ocean Beach, check out the www.obrag.org. Also check out the many linked articles on our Press Coverage page. Learn more in the FAQ section. The tradition of beach bonfires has been cherished for generations by San Diego residents and our visitors. On summer nights, the fires glow like a string of jewels along the City's beaches and around the shores of Mission Bay. City to keep fire pits in 2012-2013 budget The San Diego Mayor announced that due to a budget surplus, the city would fund the fire pits for 2012-2013 without need for donations. Fire pits saved again for 2011? Shortly after announcements that fire pits would be removed starting in July 1, several media outlets are reporting that the fire pits have been saved again. Details will follow in a press conference on May 12, 2011. Fire Pits SAVED for another year! Thanks everyone! Mayor says Fire Pits saved again by donors Mayor Sanders announced on These Days on KPBS on May 10, 2010 that a plan to save the fire pits will be unveiled today. It will continue to involve anonymous donors. Mayor to announce fire pits plan on Monday, May 10 The Union Tribune reports that councimember Kevin Faulconer office stated that the city is close to an agreement to save the fire pits.